One of the most misdiagnosed problems in a pond is a leak. By learning the basic principles of leak detection and repair, you’ll save yourself a lot of money in attempting to repair something that isn’t broken, and spare yourself the headache from worrying about your water feature! The amount of water that your pond will lose due to evaporation varies according to region, time of year, and in the Midwest, the day-to-day weather! Ponds located in Midwest climate that is moderate with high humidity can expect to lose 1 to 1.5 inches of water weekly in the warm seasons. However, no need to measure or worry about this loss: these water levels are typically replaced naturally by the rain. If, however, you live in an area with high temperatures and low humidity (think Arizona, Nevada, or the western half of the country), it’s possible to lose more than 3 inches weekly by evaporation. Of course, this is also dependent on the size and quantity of the waterfall. Cascading waterfalls lose water in its splashing nature because moving water has greater exposure than still water. Low edges will indicate a leak, as settling at the edge is common for new ponds. Often they are found around the stream and waterfall where settling could occur, or it is built up during construction from the soil of the excavation. This means that it’s necessary to inspect the edges of the perimeter of the pond. When dirt settles around the edges, it can create low spots where water can escape. Wet mulch, gravel, or mud can be indicators. If you do find a leak, all you have to do is lift the liner and push some soil under it to raise the edge. You don’t want to pay someone to do that for you, do you? “Splash leaks” are also possible if you have a bad set up of rocks settled under your waterfall. If you adjust some of the rocks under or around the waterfall, it will contain or redirect the splash. Again, another fix that you don’t want to pay for. Often the problem is in the stream and waterfall. Rocks or excessive algae growth in the stream or filter can restrict flow of water and divert the path over the later. This means you’ll want to do some light trimming of the plants and algae so the water can flow freely. Another simple, cheap, and easy fix. If you’ve put in some time with the suggestions we gave and you can’t find the problem, it’s time to take a few more drastic measures. This means you’re going to have to turn off the pump for a day. In doing so, you can determine the location of the leak. After 24 hours, if the water levels drop with the pump off, you know there is a leak in the pond. Remove any rocks around the perimeter at the level where the water has stopped. This means there is a clearing to identify where a puncture of hole may be located. When you find a hole, try patching it with a liner patch kit, which can be found at pond supply retailers. Once you patch it back up, you can replace the rocks, and fill the pond back up! If the water levels remain the same after this, the leak is not in the pond. At this point, you have to move onto checking pipes, the plumbing fittings, and the pump connections for leaks, or potentially the faceplate of the skimmer (if you have one). If the water levels stopped dropping above the bottom of the faceplate, the skimmer may not be sealed correctly. You want to investigate the skimmer without disassembling it. if you move a few rocks around the front of the skimmer, you can slide your hand behind the liner and feel for wet soil around the opening. If the soil is saturated, the faceplate likely wasn’t installed properly. This could very well be the source of the leak. If this is the case, you can remove the faceplate, clean all of the old silicone off of the liner, and check the instruction manual for proper sealing procedures. However, you can also give us a call if this is the point where you feel you’ve done all you can and you would like professional help. Losing water in your pond is not fun, and it defeats the purpose of the beautiful oasis you’ve created in your yard. It can often be frustrating and time-consuming, so we hope that these suggestions can help you manage the problem. Of course, you know where to find us if you feel that the leak is out of your spectrum of pond knowledge. 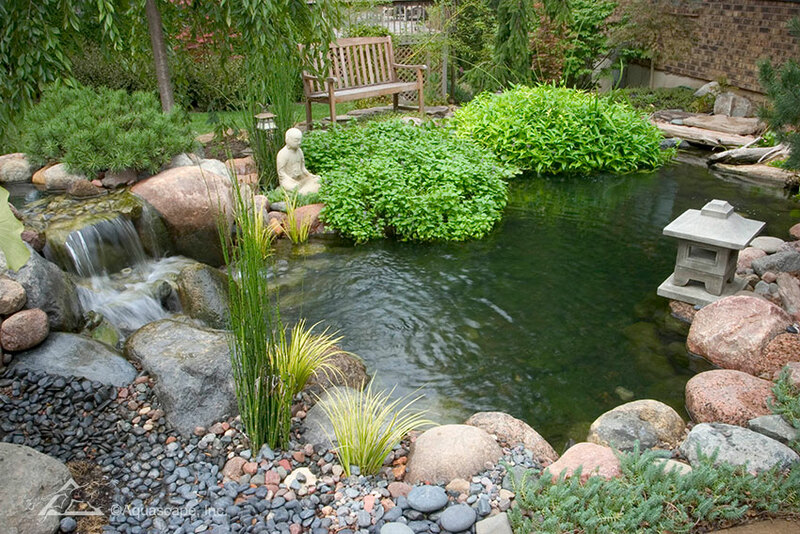 The goal is to get your pond back and running so you can continue to enjoy your water garden.